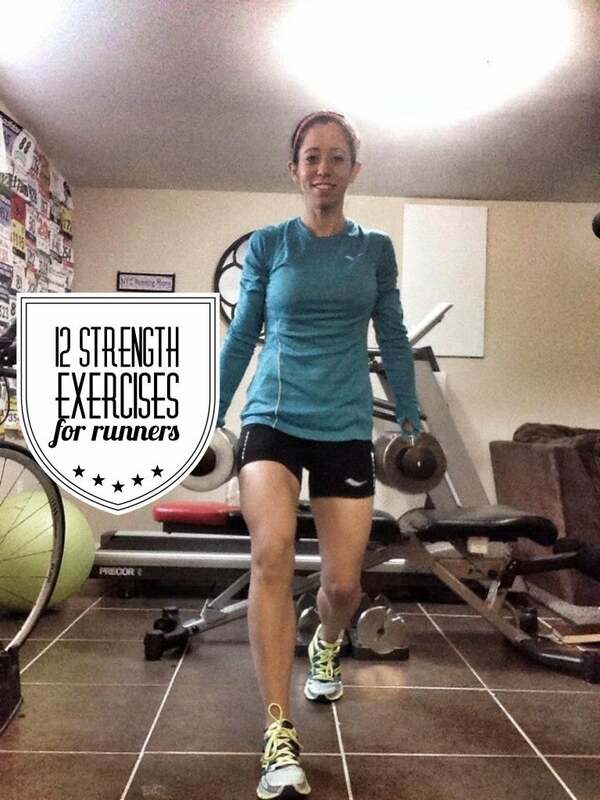 Not sure where to start with strength training? These 12 moves will help your running. When my weekly mileage increases, I’m so quick to overlook all the other little things that (should!) go into training. I have the tendency to get so wrapped up in how many miles I’m running or paces I’m hitting for workouts that I forget the other important aspects. Things like nutrition, recovery, strength and core work don’t just add to a successful marathon training cycle— they are the base of one. I used to be really diligent about core/strength work. When I was running with the Ft Hood Army 10 miler team back in 2007, I would have practice at 5am and then immediately head to the gym to do 30-45 min of weights, core or cross-training before showering and going to work by 8am. In an ideal world, I’d have more time to log all my miles and do the core/strength work I want to do. Maybe when my little guys are in school full-time, I will be able to do these things. Right now, however, it’s often a case of one or the other. And for a while, I let the little things slide in favor of running more miles. One of my two primary goals for 2015 was to get back into routine of strength work—twice a week for 30 min each— and I mostly kept to this plan. There were some days where I (wisely) chose to cut my run by 1-2 miles to leave some time for strength work. I ran Boston a couple of weeks ago and 100% believe that my 6+ minute PR was in part due to the strength work I focused on in the months leading up to the race. All of these can be done in your home with nothing but simple free weights. There are a lot of variations to these moves. You can increase the number of reps, number of sets, increase weight, etc. I aim for 15 reps on each leg and go through the entire sequence three complete times while using 10 lb weights in each hand. Some days I do all of the exercises; other days I pick and choose a few (depends on how much time I have). I like to alternate a leg exercise with a core exercise. It allows me to keep my heart rate up while resting that part of my body. Forward Lunges: Hold weights in both hands. Lunge forward with your right leg. Then back to start position. Lunge forward with left. Repeat 20-30 times (10-15 reps on each side). Deadlifts: Hold weights in both hands. Stand upright. Then lean over at the waist and bring weights to your toes. Stand back up. Repeat 10-15 times. Box/Bench Steps: Hold weights in both hands. Use a 12-18 inch high step. Step up with your right leg and bring your left knee to your chest. Put your left leg down on step. Step down with your right and then left. Repeat with right leg 10-15x. Repeat with left leg. Side Bends: Hold weight in right hand at your side. Left hand on hip. Feet shoulder width apart. Bend to the right so you feel the stretch on your left side. Repeat 10-15 times. Then repeat with weight in left hand. Foot-Elevated Single Leg Squats: Hold weights in both hands. Use 12-18 inch step (keep it behind you). 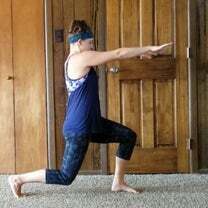 Keep right foot on step and go up and down so you are lunging with your left leg. Repeat 10-15 times. Then repeat with the right leg. Push-ups (1 minute): I do as many regular pushups as I can before going to my knees. Squats: Hold weights in both hands. Legs should be shoulder-width apart. Go all the way down (don’t let your knees pass your toes) and then up. Repeat 10-15 times. Plank with leg lifts (1 min): Get into normal plank position. Lift right leg in air and hold for 5 seconds. Lower. Lift left leg and hold for 5 seconds. Repeat. Wide-Stance Leg Squats: Hold weights in both hands. Open your stance wider than shoulder width and turn your legs out (toes are not pointing forward). Squat down and then come up. Repeat 10-15 times. Russian Twists: Sit down. Keep your back at 45 degree angle with your legs either on the floor or in the air (more advanced) so your body is making a “V”. Start with no weight and twist your upper body to the right, then to left (that’s one rep). Repeat 15-30 times. Build up to 10-15 lbs of weight. Wall Sits: Lean against wall in a sitting postion, as if a chair is under you. Can be done with or without weights. Start with 30-45 seconds and gradually increase by 15 seconds. V-ups: Lie flat on the floor. Keeping your legs straight, then lift them up in the air. At the same time, bring your upper body up to a sitting position so you can touch your toes. Let your upper body and legs return to the starting, flat position. Repeat 10-15 times.